Both AT&T and Verizon introduced new data plans not long ago, and we are comparing their unlimited options - AT&T's Enhanced Plus and Choice, Verizon's Above, Go and Beyond Unlimited, T-Mobile's One and One Plus, as well as Sprint's Unlimited Freedom, which is the cheapest of the bunch, with a running promo offering two or more lines for just $100. There's been a lot of moving and shaking since US carriers went all unlimited last year. T-Mobile increased its prices, Verizon limited its "unlimited" option a bit, and AT&T enhanced the Plus and Choice plans to a level where Choice customers can be "deprioritized" at any time for paying a bit less, but don't have a blanket 3Mbps restriction anymore, plus the same goes for Verizon's cheaper option, too. One simple look at the quarterly profits of the big four US carriers, and some recent network speed tests would tell you why all of this is happening. After an initial period of amassing customers, switchers, and goodwill, T-Mobile bumped its unlimited One Plus data plan with ten bucks apiece, making it pretty close to AT&T and Verizon's offerings, but not quite, as taxes and fees are included in the price with T-Mobile. When it comes to Sprint, it has been posting comparisons to showcase the running promos that make it much cheaper than the rest of the gang since, well, since it's been much cheaper than the others. America's largest carrier will grant you at least a bar or two from the cornfields of Illinois, to sweet home Alabama, but that superior network of towers will cost ya - Verizon's unlimited plans are at the highest price, both for a single line ($95 w/AutoPay), and for the most popular 4-line family endeavor. You can, however, mix and match plan types on each line, even within the same family, which is pretty unique as far as carrier offers go. The second-largest US carrier also has very expansive coverage outside of big cities, casting a bit smaller net than Verizon, and has a bit cheaper unlimited prices to reflect on that, at $80 for a single line. It does over free HBO streaming, though, and its GSM network means a much wider range of compatible phones, so its "enhanced" plans can hit the nail on the head for you. Underestimate the Un-carrier at your own peril. Flamboyant CEO aside, ever since T-Mobile started a plan price war with the big guys, the combination of aggressive marketing and great phone/plan discounts, propelled it to new heights in subscriber growth. That phase seems to be abating now, though, and its prices ($80 for a single line) reflect what's on offer - fastest average download speeds, largest data cap, and free Netflix, but a tad weaker coverage outside big metropolitan areas, compared to AT&T or Verizon. 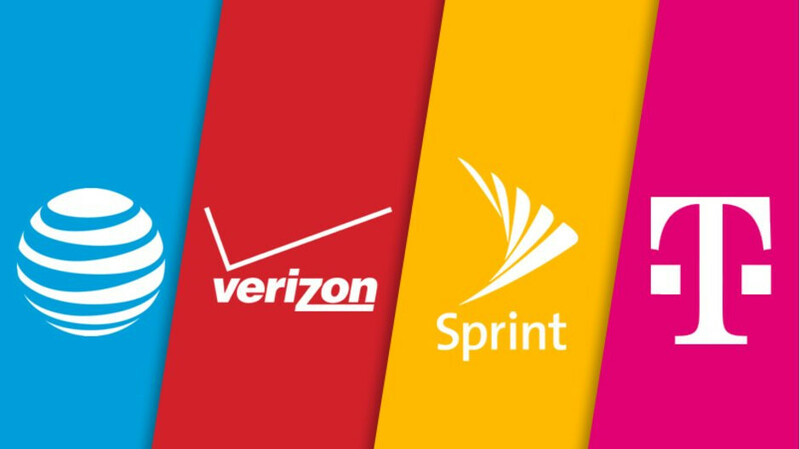 The fourth-largest US carrier has the most affordable unlimited plan prices currently on offer. Heck, you can get 4 lines for your family at just $100 with the running promo! Its legacy network has some way to grow, though, especially outside large cities, but if Sprint has good coverage in your area, and you don't travel all that much to the boondocks, you are golden. Free std. Netflix for 2+ lines at full price. Up to 5GB of 4G LTE for Canada and Mexico (except Essentials). Mythbusters More plan customers can experience speed deprioritization at any time. Off-net (roaming) data may be at 2G. The Go Unlimited customers can experience speed deprioritization at any time Free international data (except Canada and Mexico up to 5GB) may be with restricted speeds. So, which unlimited data plan is the best? We'll go out on a limb here, and say that the new AT&T offerings seem to be the best balance of coverage/monthly outlays. Its prices are now close to T-Mobile's, but it offers a wider LTE net, which is important if you venture outside big cities and highways. For about $5 per line more, however, you can get Verizon's superior coverage that blankets 400,000 square miles more territory than AT&T. In addition, data guzzlers and frequent travelers will appreciate Verizon's Above Unlimited plan perks. If you mostly chill in a large city, you may save a bunch of money with Sprint, or take advantage of the higher 50 GB "speed de-prioritization" threshold, and the other perks that T-Mobile offers. All in all, the moral of the story stays the same - whatever plan you chose, make sure its carrier has decent coverage in the areas you frequent the most! You forgot to put T-Mobile simple unlimited. It has 15GB of hotspot at 4G. This is very helpful, thank you! I'm glad that this was broken down by the number of lines. My favorite unlimited is the MetroPCS 4 lines for $100. I've never been throttled, and we got 3 free Galaxy J7 Primes and one LG Stylo 3 Plus for $50 for porting in. actually Cricket (AT&T) is trully, well was trully the best deal. $100 for 5 lines. They no longer offer it. Been with att since 2004 and have never thought about leaving. Then you must not be very smart. "Hotspot data is at 3G speeds, for LTE you got to shell out $25 per line" This is not accurate. The One Plus plan allows for 10GB of high speed tethering. $25 allows for unlimited high speed tethering. Since promo pricing was included, it should also be included for T-Mobile One Plus (4 lines on promo are $180). Under Hotspots, T-Mobile includes 512Kbps for regular One plan. Since you are including International, you should also include a column for Canada and Mexico. Those are the most likely destinations for users and the offerings are very different than the generic international offerings. No idea how but I got a sweet T-Mobile deal. Not sure if it was because I transferred in from Verizon but I have 3 Unlimited Data lines. My 3rd line was free. All the lines have HD video, unlimited hot spot for all lines, and I only pay $100 a month, $80 if I get both of my main two lines under 2 GB or data each. Its not mentioned, but Xfinity Mobile comes out as the best deal. $12/gb or $45/mo unlimited. Better yet they are using Verizon's network, in which is better than Sprint and TMobile. I will be cutting over within the next few months from Verizon. I pay about $151 for (2) iPhone 7 Plus 256GB models. My bill should be reduced by $50 a month. HA! Xfinity/Comcast. They are twisted insane crooks. The worst company. They always raise their cable tv prices $5 each year. And lie to you when u change "bundles" packages and u get a huge bill. I would NEVER ever trust them. Not to mention they officially have the WORST customer service on record. In terms of Xfinity i have no issues regarding services and cost. 1. 6 HD Receivers with DVR, 300Mbps of internet, Home Security, free HBO, Showtime, Cinemax for two years = $210 including taxes for the last 6 months and longer for up to two years. 2. Paying $7.50/mo for an LG V-Charge. As a result received a $500 gift card last month that I haven't used yet. I don't use the phone. Sitting in the drawer. 3. Received a 128GB iPad 9.7 Wifi for $5/mo (valued at $429). My cost is only $120 over two years. 4. No interruptions of services. 99.9% run rate of my network. Not sure who you trust, but I am living proof... ATT/DirecTV or any cable company can't touch this offer. Tell me what you have and what is better than this offer? Nope. Not in my area. Its $150 a month for 1 HD cable box and a cable card, and the digital Preferred service package (the ONLY package that has the channels i want) here for me in MN. My folks 20 miles north of me pay around $300 a month for 1 HD X1 cable box DVR and 100meg internet. I and my neighbors have had numerous issues with them over the years. There is no other cable tv options in my area. You need to learn to negotiate. In my case, I'm getting a smoking deal. Do you agree? How about Verizon Fios 100/100 internet for $20.65 a month? U can get 1gig Internet for that cost in the UK. For those where unlimited in not necessary...Check out Republic Wireless. (A tmobile GSM MVNO. A Sprint CDMA sim is available if needed) Its $15 base plan (unlimited talk,text,wifi) + $5 per GB. It's cheaper and supports much more phones than Google's Project Fi. Sprint is the best value by far!!! I switched from AT&T to Sprint when the iPhone 8 release. I am very happy with the service and the lower bill! For $150.00 per month plus tax for 5 lines I have an old legacy T-Mobile plan each line has unlimited text, voice, unlimited LTE data with full HD streaming and 15 GB LTE hotspot it breaks down to around $35.00 per line after taxes. I'm grandfathered in at the One Plus at no additional cost plus a couple of complementary lines. I'm at $145 all in for 4 voice and 2 tablet lines. I could not be happier. T-Mobile: "All taxes&fees included." That's is a $20+ price advantage on a four line plan. That throws the whole comparison in favor of T-Mobile, in less you spend a lot of time in the boonies (and even there, T-Mobile's catching up with their new 600Mhz spectrum). Not to mention, Canada and Mexico 4G roaming, rest of the world free 3G+, etc. It's really no contest. 6 lines for $120 with TMobile simple unlimited and 15GB of hotspot. You can't beat this deal!!! T-Mobile has the best offer right now with the 4th line free, taxes and fees included with the price, free Netflix, and 50GBs of data. Actually Comcast Xfinity Mobile which is supported by Verizon has unlimited for $45 atm. 1 line, 2 lines, 3 lines........it doesn't matter you still get that low price. Both Verizon unlimited plans include unlimited Canada and Mexico usage as well. Weird it is mentioned for AT&T, but not Verizon.